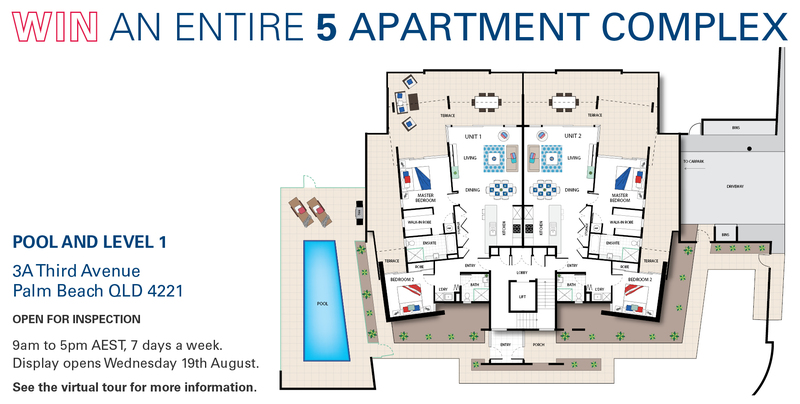 An entire 5 apartment complex with ocean views! In Draw 329, Win an entire 5 apartment complex including your own luxury penthouse with stunning ocean views. This stunning beachside apartment complex features five fully furnished apartments including a luxury four bedroom penthouse boasting sweeping ocean views from its balcony, expansive indoor living area and master bedroom. 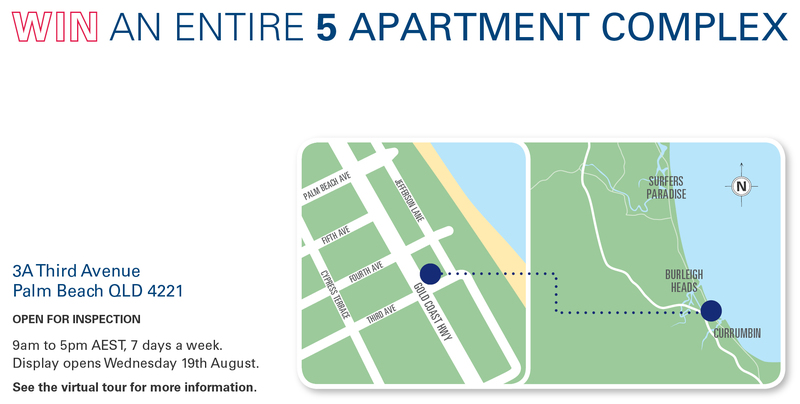 Only a one minute walk to the Gold Coast’s Palm Beach, this fantastic prize gives you the option to sell tax free, rent and receive the highest ever yearly estimated income of $201,760 P.A. 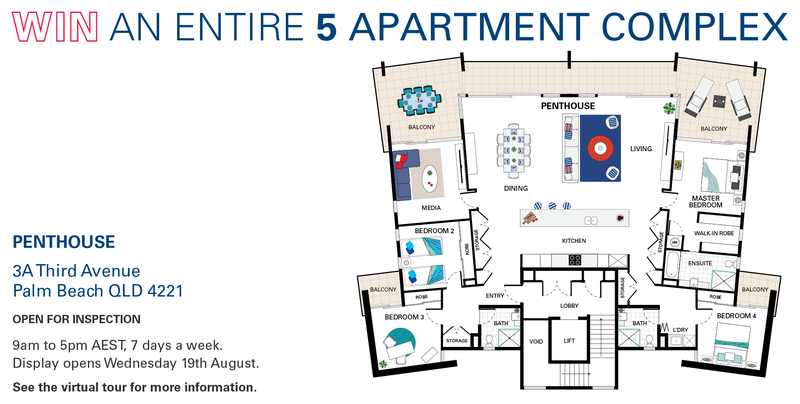 or live in the luxurious penthouse, while enjoying an income from your impressive investment portfolio. A luxury 4 bedroom penthouse with sweeping ocean views. Expansive indoor and outdoor entertaining area with BBQ and plenty of space for family and friends. Master bedroom boasting floor-to-ceiling ocean views with ensuite and walk-in robe. 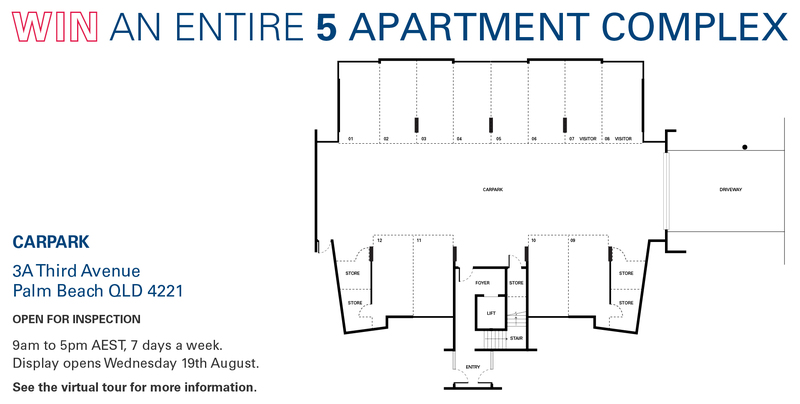 Every apartment features open plan living and dining areas that lead to spacious balconies where you can enjoy the beachside location. Includes furniture and electrical appliances worth $272,637. PLUS a $2,000 travel voucher. just got my ticket, good luck to all.